What are the best practices of mission work? Better Together is a layperson's guide to many of the most common questions faced by churches working in mission. George puts her wealth of mission experience to work translating solid biblical missiological content into everyday language. Each chapter begins with a case study and addresses key questions and challenges encountered. The book also contains a study guide. 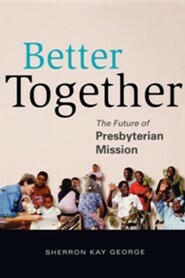 This is a wonderful resource for mainline Protestant churches active in mission projects and will prove especially helpful for the Presbyterian Church (U.S.A.) and its various mission agencies. It is also perfect for individual or group study, for training sessions for mission-committed congregants, and for the boards of mission initiators. Sherron Kay George has been a mission worker and teacher in Brazil, Associate Professor of Evangelism and Missions at Austin Presbyterian Theological Seminary, and consultant to the Worldwide Ministries Division of the Presbyterian Chruch (U.S.A.). She was a contributor to Teaching Mission in a Global Context. I'm the author/artist and I want to review Better Together: The Future of Presbyterian Mission.